Lower Blepharoplasty Surgery – What is the Tear Trough? Today, lower blepharoplasty (cosmetic eyelid) surgery is more than removing skin/muscle and fat from the eyelids (remove eyelid bags). In fact, this older form of surgery (what we refer to as subtractive lower blepharoplasty) often leads to a sullen, guant, aged and altered appearance. Cosmetic eyelid specialists (oculoplastic surgeons) have come to learn that preserving, augmenting and redistributing what is considered excess eyelid tissue is a more effective means of cosmetic rejuvenation (so called “additive blepharoplasty”) of the eyelids than removing this tissue. The basic goal is to reduce the prominence of eyelid bags while simultaneously filling depressions around the eyes (ie. dark circles and depressions). These depressions are generally referred to as “periorbital or eyelid hollows.” Rather than removing precious eyelid fat – we instead transpose the excess to the hollows to reduce the elevations (fat prominence) and fill the depressions (eyelid hollows). This nicely smoothes all contour irregularities and re-creates the natural contours of youth. As stated the eyelid hollows are generally referred to as “periorbital hollows.” The most nasal depression (closest to the nose) has been called the tear trough (as tears can well-up there). Its medical name is the “nasojugal fold.” This area responds well to fill from above with native eyelid fat excess. The procedure to do this is commonly referred to as fat repositioning lower blepharoplasty. The goal of lower lid surgery is to improve appearance. Lower blepharoplasty with fat repositioning allows this result. To avoid complications, it is imperative that your surgeon is an expert in this field. Blepharoplasty or eyelid surgery is one of the most commonly performed cosmetic and functional facial surgical procedures in the United States today. It is performed by all aesthetic facial specialties – but is best when in the hands of a cosmetic eyelid surgical specialist – or an oculoplastic surgeon. The reason surgery is best performed by eyelid surgery specialists is to avoid complications to the eyes. 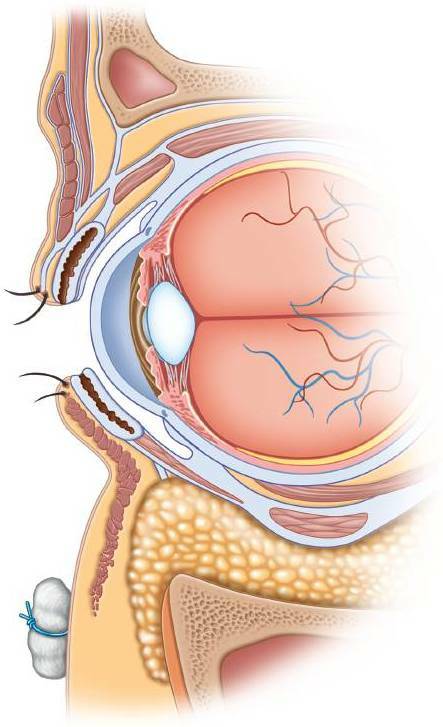 These complications include the true ocular problems such as the inability to close the eyes, dry eyes, reduced vision, chronically irritated or infected eyes, or constant pain in the eyes. Complications can also affect appearance and include a “wide-eyed” look, a “cat-eyed” look, upper and lower lids that are hollow, a rounded eye (i.e. lost normal shape), lower lids that are pulled down, or an abnormal outer corner to the eyes. These complications can be avoided by an appropriate preoperative evaluation and by having surgery performed by a “true” eyelid specialist. Dr. Guy Massry (Beverly Hills ophthalmic Plastic surgery) is an oculoplastic surgeon with vast expertise in cosmetic blepharoplasty surgery. Dr. Massry can be reached through his website or at his office at (310) 657-4302. Dr. Massry would be happy to see you for your eyelid surgery needs. Blepharoplasty is a cosmetic or functional (to improve vision) eyelid surgery whose goal is to improve appearance or field of vision. Blepharoplasty surgery can involve the upper or lower lids and can be performed under local anesthesia (patient awake with numbing shots), under twilight anesthesia (sedated) or under general anesthesia (patient completely out). The key to successful surgery is not knowing when to do surgery, but rather when not to do surgery. In the next series of blogs Dr. Guy Massry will review when it is not appropriate to perform blepharoplasty surgery. This will include in cases when the eyes are in danger of complications, when added procedures (such as canthoplasty, canthopexy, ptosis repair, brow lifting, mid face lifting or fat grafting ) are required but not suggested, when there is a significant dry eye condition, when the patients’ medical health or medications they take limit proceeding, or when expectations cannot be met.